Janice Voss was divorced from Brian D. Ford and that is why she used her maiden name again. In the mission patch was the name "Ford" replaced by "Voss". 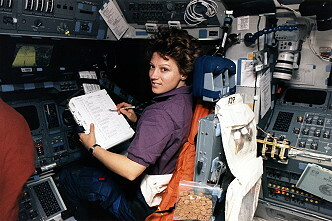 Eileen Collins became the first female Shuttle pilot. STS-63's primary objective was to perform a rendezvous and fly around the Russian space station Mir. The objectives of the Mir Rendezvous/Flyby were to verify flight techniques, communications and navigation aid sensor interfaces, and engineering analyses associated with Shuttle/Mir proximity operations in preparation for the STS-71 docking mission. Other objectives of the flight were to perform the operations necessary to fulfill the requirements of experiments located in SPACEHAB-3 and to fly captively, then deploy and retrieve the SPARTAN 204 payload. Two crewmembers were scheduled to perform a five hour spacewalk. 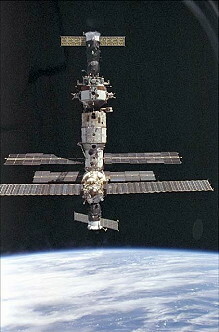 The Discovery performed the first rendezvous maneuver with the Mir space station. After extensive negotiations and technical information exchanges between U.S. and Russian space teams, Russians concluded close approach could be safely achieved and the STS-63 crew was given 'go' to proceed. R1U thruster manifold was closed and the backup thruster was selected for the approach. 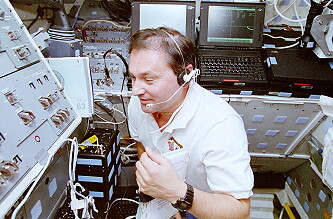 Ship-to-ship radio contact with Mir was achieved well ahead of time, and Vladimir Titov, who had previously lived on Mir for more than a year, communicated excitedly with the three cosmonauts aboard the space station: Mir-17 Commander Aleksandr Viktorenko; Flight Engineer Yelena Kondakova; and Valeri Polyakov, a physician who had broken Vladimir Titov's record for extended time in space. 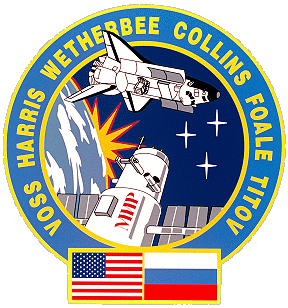 After stationkeeping at a distance of 122 meters (400 ft) from Mir and with James Wetherbee manually controlling the orbiter, Discovery was flown to 11 meters (36 ft) from the Russian space station. "As we are bringing our spaceships closer together, we are bringing our nations closer together", James Wetherbee said after Discovery was at point of closest approach. "The next time we approach, we will shake your hand and together we will lead our world into the next millennium." The closest approach to Mir of 11 meters (36 ft) occurred on February 06, 1995 at 19:23:20 UTC. "We are one. We are human", Aleksandr Viktorenko responded. 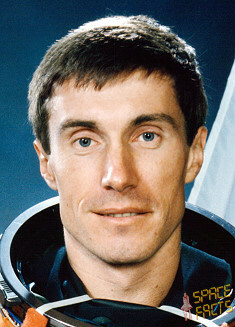 James Wetherbee then backed away to 122 meters (400 ft) and performed one and a quarter-loop flyaround of Mir while station was filmed and photographed. The Mir crew reported no vibrations or solar array movement as result of the approach. The rendezvous sequence began about nine hours into the mission when a reaction control system jet firing adjusted the rate at which Discovery is closing on Mir. Over the next few days, additional burns gradually brought Discovery to within eight nautical miles (14.8 km) behind Mir. At this point, the Ti burn was fired and the final phase of the rendezvous began. Discovery closed the final 8 nautical miles (14.8 km) to Mir during the next one-and-a-half-hour orbit. At this point, the Shuttle's rendezvous radar system began providing range and closing rate information to the crew. The manual phase of the operation began just after Discovery passed about a half-mile below Mir when Commander James Wetherbee took the controls at a distance of about 2,000 feet (609 meters). James Wetherbee flew the Shuttle from the aft flight deck controls as Discovery circled up to intersect the velocity vector of Mir. The velocity vector, also known as the V-Bar, is an imaginary line drawn along Mir's direction of travel. James Wetherbee stopped Discovery's approach when the Shuttle reached a point about 400 feet (121.9 meters) directly in front of Mir. After the Shuttle moved to within 1,000 feet (304.8 meters) of Mir, Discovery's steering jets were fired in a mode called "Low Z". This approach used braking jets that were slightly offset to the Mir rather than steering jets pointed directly at the Station, thus avoiding contaminating or damaging the Station. Also, as Discovery reached close proximity to Mir, the Trajectory Control Sensor, a laser ranging device mounted in the payload bay, supplemented the navigation information by supplying data on the Shuttle's range and closing rate to Mir. Discovery maintained its position 400 feet (121.9 meters) in front of Mir until Flight Control teams in Russia gave a "go" for the Shuttle's approach. James Wetherbee then slowly flew the Orbiter from 400 feet (121.9 meters) to a point about 30 feet (9.1 meters) from Mir, aligning with the Station's docking module in a rehearsal of a docking approach planned for Shuttle mission STS-71. To assist with the alignment, James Wetherbee watched the approach from a centerline television camera, mounted in the upper window of the Spacehab module, on a monitor in the aft flight deck. When within about 200 feet (61 meters) of Mir, Discovery began air-to-air communications with cosmonauts on Mir using a VHF radio system. At 30 feet (9.1 meters) from the docking port, James Wetherbee was again stationkeeping, rehearsing a maneuver to orient Discovery properly to the docking port, before slowly backing the Orbiter away from Mir. When Discovery was again about 400 feet (121.9 meters) from Mir, James Wetherbee began a slow fly-around, maintaining a distance of about 450 feet (137.2 meters) from Mir. Discovery completely circled Mir once over the next 45 minutes. The two spacecraft began the separation sequence when Discovery reached a point about 450 feet (137.2 meters) above Mir for the second time. The Orbiter then fired its steering jets in a maneuver that put it on a course to eventually take it ahead of Mir as Discovery opened the distance between the two spacecraft with each orbit. Throughout the operation, Discovery's crew used video and still cameras to document the exterior of the Mir. The crew deployed the SPARTAN 204 platform on the next flight day. SPARTAN 204, the Shuttle Pointed Autonomous Research Tool for Astronomy, was a free flying retrievable platform. It was designed to obtain data in the far ultraviolet region of the spectrum from diffuse sources of light. SPARTAN 204 obtained data in the far ultraviolet region of the spectrum from diffuse sources of light. For this mission, the SPARTAN 204 spacecraft was designed to operate both while attached to the Shuttle's Remote Manipulator System (RMS) or robot arm, and in free-flight away from the Orbiter. The Far Ultraviolet Imaging Spectrograph (FUVIS) experiment objectives were to study astronomical and artificially-induced sources of diffuse far-ultraviolet radiation. The astronomical diffuse sources included nebulae, celestial diffuse background radiation and nearby external galaxies. 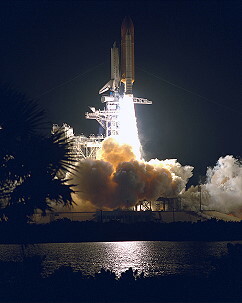 The artificial sources included emissions associated with the Orbiter - the discovered Shuttle surface glow and emissions due to Shuttle Reaction Control system rocket engines. The Orion Nebula is an example of a cloud of interstellar material which is excited to glow by the far-ultraviolet light emitted by the very hot stars embedded within it. The Cygnus Loop is an example of a supernova remnant - a shell of interstellar gas which is excited to glow by the outwardly-moving shock wave produced by a stellar explosion - a supernova - which occurred about 50,000 years ago. The science payload is mounted aboard the SPARTAN carrier. When the Shuttle was on orbit and the payload bay doors were open, Vladimir Titov used the robot arm to lift SPARTAN from the payload bay. The instrument on the SPARTAN carrier was controlled over a command path through the robot arm while James Wetherbee pointed the spacecraft on the end of the arm using the robot arm's controls. Several pointing sequences were performed over one and a half orbits. After this part of the science mission is over, tracking control system tests were performed using the spacecraft on the end of the robot arm before the spacecraft was berthed. 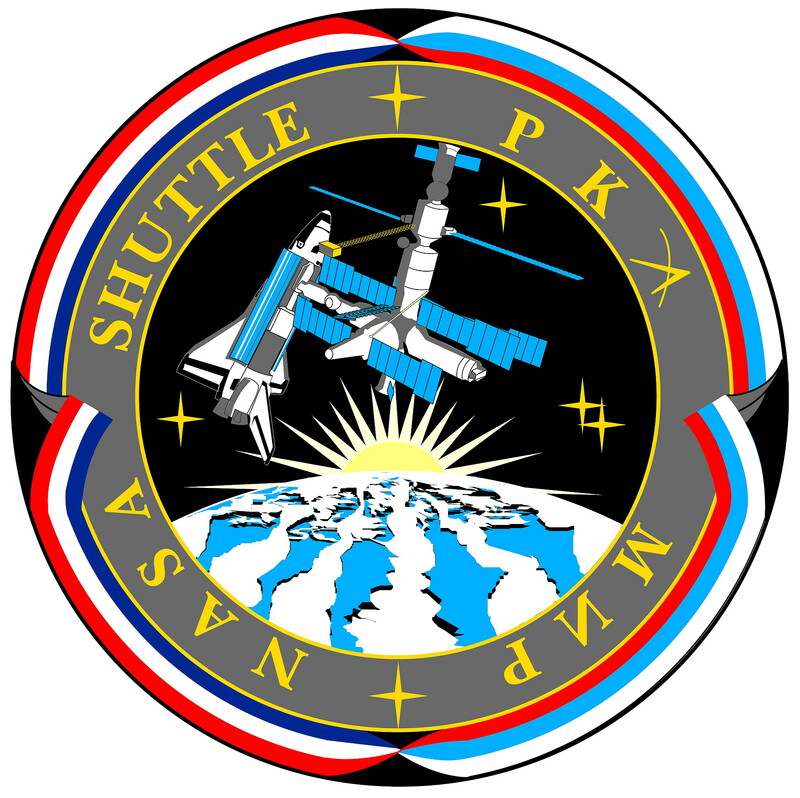 After the Mir rendezvous portion of the mission was complete, Vladimir Titov again used the robot arm to lift the SPARTAN spacecraft from the payload bay, and this time released it over the side of the Shuttle. 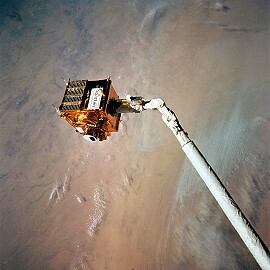 It was deployed from the Shuttle so that it could operate independently and left the Orbiter free for other activities. Because the SPARTAN and Shuttle became separated, the SPARTAN was able to view the celestial targets clear of any contamination which might be generated by Shuttle thruster firings. For approximately 40 hours, SPARTAN 204's instrument observed various celestial targets of interest as the Space Shuttle paced it from behind. 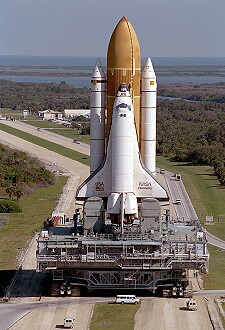 About four hours prior to the scheduled retrieval, the Shuttle performed engine firings allowing it to close on SPARTAN 204, eventually passing directly below it before a James Wetherbee manually flew the final few hundred feet (approximately 100 meters) to allow the satellite to be grasped by the robot arm with Janice Voss at the controls. Once caught by the arm, SPARTAN 204 was brought back into the cargo bay. The only EVA in this mission was performed by Bernard Harris and Michael Foale on February 09, 1995 (4h 39m), to test modifications in their spacesuits and to gain experience in handling large masses in space. Several modifications have been made to the spacesuit systems to prevent astronauts' hands from becoming cold. On the liquid cooling garment, for example, the cooling tubes running down the arms have been bypassed so the spacewalkers' arms are not cooled. Additional layers of material have been added to the thermal undergarment and the exterior of the suit's gloves for warmth. 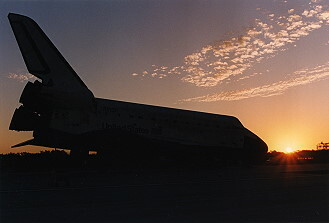 The evaluation of the modifications were performed when Discovery was positioned with its belly pointed toward the Sun and the payload bay shadowed, creating the coldest environment possible. 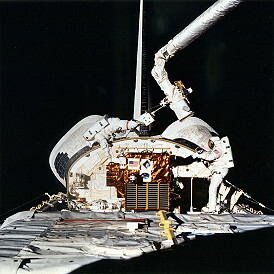 The robot arm, with Michael Foale and Bernard Harris on it, was extended by Vladimir Titov above the payload bay, clear of the Orbiter's radiated heat. Michael Foale and Bernard Harris stayed in that position without performing any work for about 15 minutes, all the time providing ground engineers with objective feedback and data on their thermal comfort levels. The mass handling exercises were performed with the SPARTAN spacecraft, which was returned to the payload bay only a few minutes before start of the EVA. The exercise began with Michael Foale in a Portable Foot Restraint on the end of the robot arm and Bernard Harris in a restraint on the SPARTAN's support structure. Vladimir Titov moved Michael Foale into position to grab SPARTAN from its berthing platform. 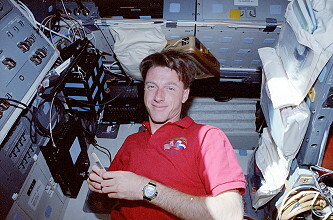 Michael Foale then handed the satellite to Bernard Harris who performed a series of translation and rotation maneuvers. When he was finished, Bernard Harris handed the satellite back to Michael Foale, who repeated the activity on the end of the robot arm. The Spacehab module carried 20 experiments: 11 biotechnology experiments, three advanced materials development experiments, four technology demonstrations and two pieces of supporting hardware measuring on-orbit accelerations. Improvements had been made to the SPACEHAB system to reduce demand on crew time. A new video switch had been added to lessen the need for astronaut involvement in video operations, and an experiment interface had been added to the telemetry system to allow the experiment investigator to link directly via computer with the onboard experiment to receive data and monitor status. Charlotte, an experimental robotic device being flown for first time, also reduced crew workload by taking over simple tasks such as changing experiment samples. Other experiments were Cryo Systems Experiment (CSE), the Shuttle Glow (GLO-2) experiment, Orbital Debris Radar Calibration Spheres (ODERACS-2), the Solid Surface Combustion Experiment (SSCE), the Air Force Maui Optical Site Calibration Test (AMOS) and the Midcourse Space Experiment (MSX). Among plant growth experiments were ASTROCULTURE (ASC), flying for fourth time on Shuttle. The objective of ASTROCULTURE was to validate performance of plant growth technologies in the microgravity environment of space for application to a life support system in space. The investigation had applications on Earth, since it covered such topics as energy-efficient lighting and removal of pollutants from indoor air. One of the pharmaceutical experiments, Immune, also had Earth applications. Exploiting a known tendency of spaceflight to weaken the immune system, Immune experiment tested the ability of a particular substance to prevent or reduce this weakening. Clinical applications could include treatment of individuals suffering from such immunosuppressant diseases as AIDS. The ASC-1 flight experiment, conducted during the USML-1 mission on STS-50, evaluated the WCSAR concept for providing water and nutrients to plants. The ASC-2 flight experiment, conducted during the SPACEHAB-1 mission on STS-57, provided additional data on the water nutrient delivery concept, plus an evaluation of the light-emitting diode-based plant lighting concept. 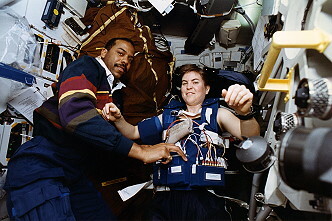 The ASC-3 flight experiment, included in the SPACEHAB-2 STS-60 mission, provided data for a concept to control temperature and humidity in a closed-plant growth chamber. Results from these flight experiments confirmed the validity of these concepts for use in a space-based growing unit. BioServe examined Rhizobium trifolii behavior in microgravity. Rhizobia are special bacteria that form a symbolic relationship with plants. The bacteria infect the plants early in seedling development to form nodules on the plant roots. The bacteria in these nodules derive nutritional support from the plant while, in turn, providing the plant with nitrogen fixed from the air. Plants that form such relationships with rhizobia are called legumes and include alfalfa, clover and soybean. Such plants do not require synthetic fertilizers to grow. In contrast, many important crop plants such as wheat and corn are dependent on synthetic fertilizers since they do not form symbolic relationships with rhizobia. Understanding the multi-step process associated with rhizobia infection of legumes may make it possible to manipulate the process to cause infection of other crop plants. The potential savings in fertilizer production would be tremendous. Biological Research in Canisters (BRIC-3): In this research, soybean seeds were rolled in germination paper and placed in tubes located inside BRIC canisters. 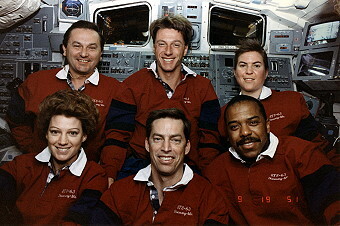 The experiment was sealed and housed in the middeck of the Space Shuttle. The experiment itself was passive, however, the crew was required on mission day five to transfer one canister to the freezer. Freezing these samples will dramatically increase the science return for this investigation by allowing an examination of plants developed in microgravity to be contrasted with control groups developed in regular gravity. CHARLOTTE: This robot did not employ gantries, jointed-arms or complicated systems. 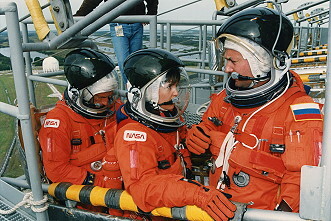 Charlotte, when deployed by the STS-63 crew, was suspended on cables which are relatively easy to install and remove. Among Charlotte's experimental objectives were to operate knobs, switches and buttons inside the SPACEHAB module. The robot also had the capability to change out experimental samples and data cartridges and perform many other inspection and manipulation tasks thereby automating many routine procedures and freeing the flight crew to perform other tasks. CHROMEX-6: In previous spaceflight experiments, it has been observed that plants exposed to microgravity exhibit abnormalities in cell shape and structure. Many of these observations can be linked to changes in the plant cell walls. These cell walls of plants determine many aspects of plant growth, including shape, growth rate, cell-cell recognition, and composition of fiber to name a few. Many of the biochemical features that characterize mature, functional cell walls are catalyzed by cell wall-associated enzymes. The CHROMEX-6 study should help explain the role of these enzymes in establishing normal cell wall structure and function. The species being studied were Superdwarf Wheat (Tritucum aestivum) which were planted 48 hours prior to flight. These plants developed under laboratory conditions until specimens were loaded for flight. Commercial Protein Crystal Growth (CPCG): The protein crystal growth experiments aboard STS-63 consisted of two crystallization systems: the Vapor Diffusion Apparatus (VDA) and the Protein Crystallization Facility (PCF). The objective of the VDA experiments aboard STS-63 was to use the microgravity environment to produce large, well-ordered crystals that yield X-Ray diffraction data that are superior to the data from their Earthgrown counterparts. The objective of the PCF experiment, contained in a thermal control enclosure located in the middeck, was to crystallize human alpha interferon protein. Alpha interferon is a protein pharmaceutical that currently is used against human viral hepatitis B and C. The objective was to discover the next generation alpha interferon pharmaceuticals and formulations. 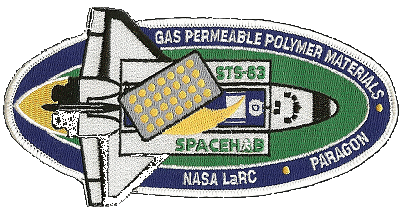 The SPACEHAB-3 Equipment for Controlled Liquid Phase Sintering Experiments (ECLIPSE) experiment investigated the "Liquid Phase Sintering" (LPS) of metallic systems. "Sintering" is a well-characterized process by which metallic powders are consolidated into a metal at temperatures only 50% of that required to melt all of the constituent phases. In LPS on Earth, a liquid coexists with the solid which can produce sedimentation, thus producing materials that lack homogeneity and dimensional stability. To control sedimentation effects, manufacturers limit the volume of the liquid. The ECLIPSE experiment examined metallic composites at or above the liquid volume limit to understand more fully the processes taking place and to produce materials that are dimensionally stable and homogeneous in the absence of gravity. 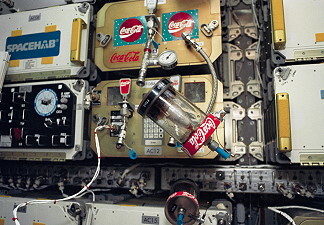 The concept of "defect trapping in microgravity" was pursued during this experiment. The knowledge gained from the experiments will be applied toward preventing or controlling defect formation. The Solid Surface Combustion Experiment (SSCE) was a major study of how flames spread in a microgravity environment. Comparing data on how flames spread in microgravity with knowledge of how flames spread on Earth may contribute to improvements in all types of fire safety and control equipment. This was the eighth time SSCE had flown aboard the Shuttle, testing the combustion of different materials under different atmospheric conditions. The experiment hardware was flown in the Shuttle middeck in place of the four middeck stowage lockers. 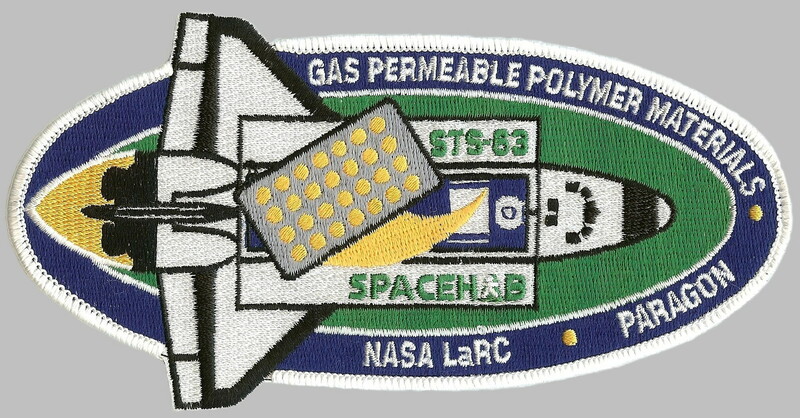 In the SSCE test planned for STS-63, scientists investigated flame spread along a sample of Plexiglas in an environment of 50% oxygen and 50% nitrogen at 1 atmosphere pressure. This flight was the third test with the Plexiglas fuel. 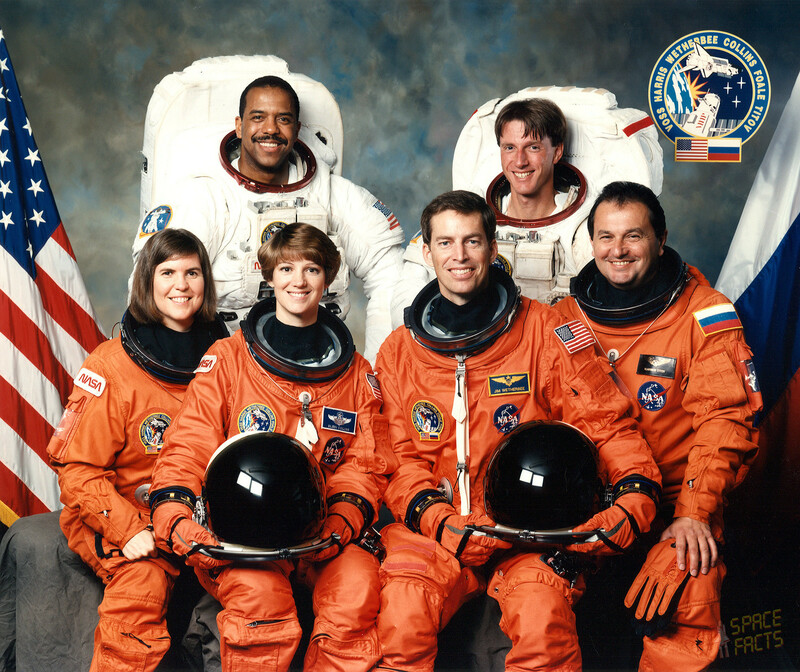 The previous tests were performed on STS-54 with an environment of 70% oxygen and 30% nitrogen at 1 atmosphere and STS-64 with an environment of 50% oxygen and 50% nitrogen at 2 atmospheres. The Air Force Maui Optical Site (AMOS) tests allowed ground-based electro-optical sensors located on Mt. Haleakala, Maui, Hawaii, to collect imagery and signature data of the orbiter during cooperative overflights. The scientific observations made of the orbiter, while performing reaction control system thruster firings, water dumps or payload bay light activation or the phenomena of "Shuttle glow", a well-documented fluorescent effect created as the Shuttle interacts with atomic oxygen in Earth orbit, and were used to support the calibration of the AMOS sensors and the validation of spacecraft contamination models. The AMOS tests had no payload unique flight hardware and only required that the orbiter be in predefined attitude operations and lighting conditions. The Cryo System Experiment (CSE) was a space flight experiment conducted by the Hughes Aircraft Co., in a cooperative program with NASA. The overall goal of the CSE was to validate and characterize the on-orbit performance of two thermal management technologies that comprise a hybrid cryogenic system. These thermal management technologies consist of: 1) a new generation, long life, low vibration, 65 K Stirlingcycle cryocooler, and 2) an oxygen diode heat pipe that thermally couples the cryocooler and a cryogenic thermal energy storage device. The experiment was necessary to provide a high confidence zero-gravity database for the design of future cryogenic systems for NASA and military space flight applications. Shuttle Glow Experiment (GLO-2): The GLO-2 investigated the mysterious shroud of luminosity, called the "glow phenomenon," observed by astronauts on past Shuttle missions. 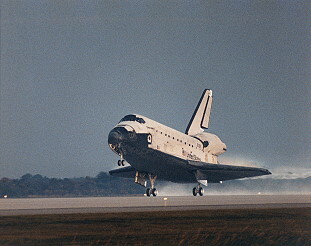 Theory suggests that the glow may be due to atmospheric gases collisionally interacting on the windward or ram side surface of the Shuttle with gaseous engine effluents and contaminant outgassing molecules. The GLO-2 experiment consisted of imagers and spectrographs, which were bore-slighted to the imagers, so that both sensors were focused onto the same area of observation, for example, the Shuttle tail. The imagers served to unambiguously identify the source region of the glow spectrum as well as to map the spatial extent of the luminosity. 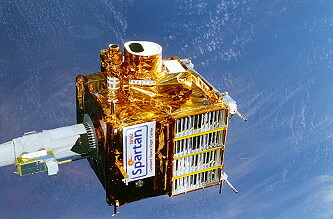 Unique features of the sensors were their high spectral and spatial resolution. Each spectrograph employed a concave holographic grating that focuses and disperses light within a small field of view (0.1 by 2.0 degrees) over the wavelength range of 115-1100 nanometers. The sensor comprised nine separate channels, each of which operated simultaneously and independently, to cover individual segments of the spectrum. Spectrally resolved light from the grating was amplified by image intensifiers that were optically coupled to a charge-coupled-device (CCD) detector. CCD-pixel readouts were summed in groups to achieve spatial mapping with a resolution of about 0.1 degrees. The IMAX Cargo Bay Camera (ICBC) was a space-qualified, 65 mm color motion picture camera system that consisted of a camera, lens assembly, and a film supply magazine containing approximately 3500 feet (1,067 meters) of film and an empty take-up magazine. The camera was housed in an insulated, pressurized enclosure with a movable lens window cover. The optical center line of the 60 mm camera lens was fixed and points directly out of the payload bay along the Orbiter Z axis with a 15 degree rotation towards the Orbiter nose. Heaters and thermal blankets provided proper thermal conditioning for the camera electronics, camera window, and film magazines. The Orbital Debris Radar Calibration System-II (ODERACS-II) experiment, released six targets, three spheres and three dipoles of different sizes from the Shuttle payload bay. The targets were observed, tracked and recorded using ground-based radar and optical sensors. The spheres were composed of polished, blackened, and whitened stainless steel and aluminum. The sphere group consisted of one 2-inch (5.1 centimeters) diameter stainless steel sphere, one 4-inch (10.1 centimeters) diameter aluminum sphere and one 6-inch (15.2 centimeters) diameter aluminum sphere. The dipoles consisted of platinum alloys chosen to maximize orbital lifetime. The dipole group consisted of one 1.740 inches x .040 inch (4,420 x 1 centimeters) diameter wire and two 5.255 inches x .040 inch (13,348 x 1 centimeters) diameter wires. The targets were ejected retrograde along the Shuttle velocity vector at velocities between 1.4 and 3.4 meters per second (4.5 to 11.1 feet per second). The estimated average orbital lifetime of the targets ranged from about 20 to 280 days and is highly dependent on solar flux and the resultant atmospheric heating. All targets completely burned up during reentry. Last update on January 02, 2019.